This plugin will generate a bunch of DMX values to control a ClayPaky’ Sharpy moving light. Exposes all parameters of the Vector Mode. 10.5+ / 32/64 universal. Download from the box. A little Quartz Composer Plugin to generate a structure of 8bit DMX values (0-255) for a Vari-Lite VL3000 Spot unit. I just happen to have to control such a unit for an upcoming installation, so I thought I could share. I’d be happy to know if it works as expected… any report welcome. It should separate the Pan/Tilt… values automatically into two 8 bit packets. Download from the box. 10.5-10.6 (untested on 10.7), universal 32/64. Today I got tired of noodling. all set up in mode 4, that would make a boring 240 noodles to hand pipe in QC. So I came up with this little plugin, that takes a input structure of booleans, counts it, and automatically generates an output structure of values and addresses, suitable for KnM ArtDMX sender. The result is only 2 noodles : one for the structure and and one for blackout. 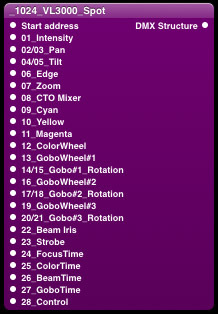 Plus I can select which mode the strobes will be operating in. Download available on request, as the sample comp uses KnM Artnet, which is payware.